* Additional charges apply for transfers outside of the regular transfer times (07:00 - 16:30) or for transfers to and from Laem Tong Beach. Please view a quotation to see the exact price for your transfer. Speedboat transfers are the fastest and offer the most flexibility of all the transfer options. The only schedule is YOUR schedule. We'll pick you up at your hotel lobby and whisk you to your awaiting speedboat. your luggage will be loaded for you and your journey across the water can begin. If you have to travel from A to B you might as well do it in style! All vessels are fully equipped with life jackets and safety equipment as is required by Thai law. The Airport Transfer Service is almost identical to the Private minibus transfer above. The only difference with the airport transfers is the information and timing of your transfer. To ensure you are picked up on time we monitor your flight arrival so we're always there (before you arrive). Equally important is your return journey and your flight time. Domestic and International flights have different advanced check-in times and we make sure that you always arrive on time. Not the cheapest, but definitely the fastest and most convenient way you can get to Phi Phi Island. Recommended when time is a factor or for groups travelling together. 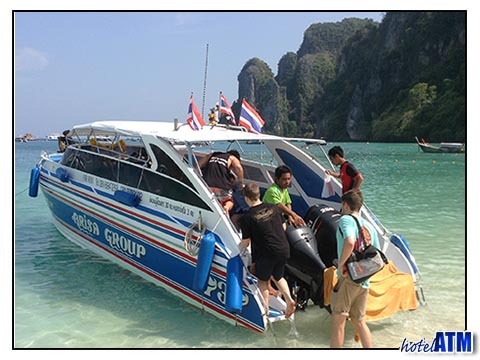 The cheapest way to get to Phi Phi Island. Recommended for individuals or couples as the most cost-effective transportation option. Private Speedboats offer the ultimate in convenience, there's no need to wait for other guests or a scheduled time to depart. Taking as little as 45 minutes to make the journey they also have the advantage of being able to take you directly to the beach closest to your resort which also greatly reduces the overall journey time. Speed boats are definitely a very cool way to travel, instead of just being transported from point A to point B, hiring a private speedboat is more like a trip out with your luggage! Undoubtedly the most convenient form of transportation, if you don't like having to fit into someone else's schedules. Or perhaps your flight lands after the last ferry of the day has already set sail. But convenience does come at a price. 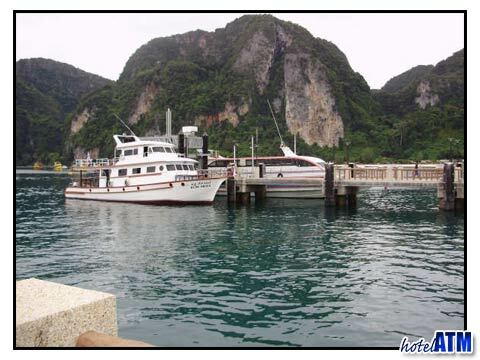 It can take as little as 45 minutes for get to Phi Phi Island from Phuket by speedboat. In comparison to the 3 hours it usually takes by ferry, which is a considerable time difference. The speedboats are more sensitive to the weather conditions and where adverse weather conditions won't slow the larger ferry they will have a considerable effect on the speedboats which will need to lower their speed to maintain safety and comfort. All speedboats are required to have safety equipment such as life jackets by law. They are usually in plain sight, but if you don't see them you should ask where they are. Speedboats can and do travel at night but it's not something we recommend, so when booking your speedboat transfer, the latest transfer time we offer will pick you up at 16:30 (4:30 pm). 4 Passengers, 8 Passengers, 12 Passengers and 18 Passengers. The more people travelling in your group the more cost effective the speedboat transfers are, so if you are travelling with friends it's well worth viewing an instant quotation. It only takes a few seconds to quote you an exact amount. It will never be as cheap as the ferry but the cheapest option is not always the best option. Your driver will be waiting for you just outside the main entrance and will be holding a sign with YOUR NAME on it. There will be lots of other drivers waiting to collect other guests so just remember you are on holiday and take your time until you see your name. Once you see the driver holding your name, you can identify yourself and present him with your transfer voucher. No additional payment is required but feel free to tip the drivers at the end of your journey if you want. Real time Koh Phi Phi weather radar images showing current weather activity on and around Koh Phi Phi. Being much smaller vessels than the ferries, speedboats of any size are naturally more susceptible to changes in weather conditions. In the event that speedboats are unable to make the crossing safely, we will organise your transfer by ferry so you arrive at your destination that day, even if it is a little slower than planned. If the speedboats are unable to run and your transfer is changed, your booking fee will also be updated to reflect the change from speedboat to ferry.